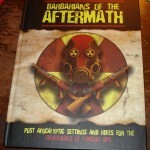 In ironic honor of today’s significance in history (and with absolutely zero disrespect intended) look at what I just picked up from the local gaming store… It’s the absolutely gorgeous full-color hardback of Barbarians of the Aftermath! The pictures don’t really do this baby justice. 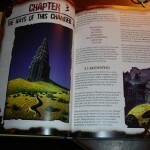 It’s pricey, to be sure, but it seems to be every bit as good quality as any other hardback RPG and the full-color art is sharp as can be. 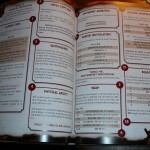 I do wish the full BoL rules could have been worked into this somehow, because it would be awfully nice to have everything in one book. But that aside, I’ve got no complaints. Well, other than the fact that, as previously noted, my players just aren’t ready to go for a system as light as BoL/BotA. But I’ll get them there eventually. Narakam awaits, after all. 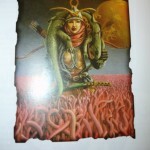 This entry was posted in Barbarians of the Aftermath on August 6, 2010 by the venomous pao. Really hope you cam get the group into a Botha game. It looks great! Excuse me as an Aussie- but what does today signify in history? Oh God, sorry- I’m an idiot. An idiot in another timeframe who jumped onto my facourite blog after a few too many beers. I don’t think you need to feel bad about the day thing, Gobbo. By the time you saw this it was well into the next day in your part of the world and all. Hell, I didn’t even realize what the day “meant” until after I’d slapped down my money and walked out to the car. Then I felt, frankly, a little oogie for having bought such a game on that of all days. Still, it does make for some odd acknowledgment of just how much the world changed after Hiroshima. That is ironic, regarding your grandfather, his experiences, and your own. The world is a funny place. One more thing. If you haven’t, check your PMs over at the BoL forum. I had a question for ya. Sorry mate – just jumped on the BoL forum but I don’t have a PM from you. I’m Ragnar over on those forums. weird. I thought for sure I’d sent it. Ah well, I have now. So have a look again when you get a chance. Cheers! Sorted! Sometimes the messages take a really long time to send on that forum. I’ve flicked you a reply. Dare I ask what’s going on…? Excellent. And trust me when I say this is a good thing. Not huge. Not particularly meaningful. Just good and fun. I’ll get the thing in the mail before the end of the week and all will be well.